If you've been reading Cheap and Sleazy for a while, you've probably seen Chuck's last appearance on these pages, where he extolled the virtues of the Tutto bag. Well, a year or so after that article came out, Chuck began the search for that perfect bag anew, and announced his intentions in a post on (I think!) CSR Nation. Apparently, Chuck beat his poor Tutto bag to death! After the funeral, Chuck tested bag after bag until he eventually found the Duet 2.0 ... and, after a few e-mails from me asking how his search was going, he sent this article and pics to me, all about his new Duet 2.0. 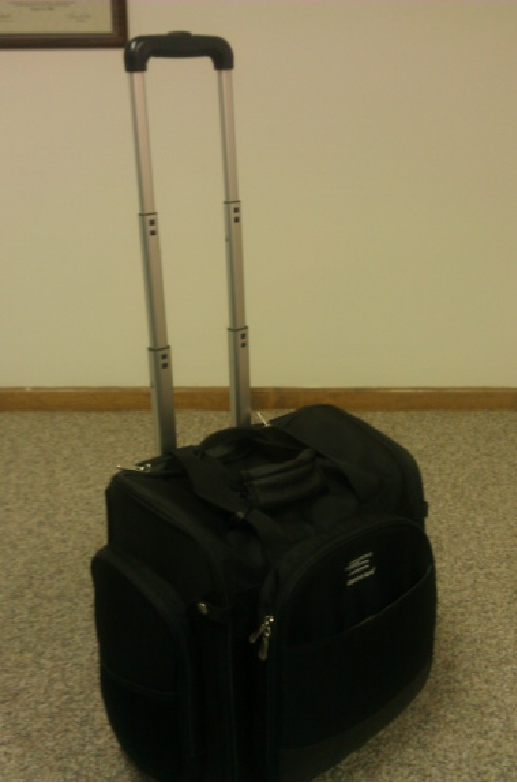 I have switched to the Duet 2.0	rolling case by Stenograph. I find it to best suit my needs at this point in my career. With the Duet 2.0, I am able to accomplish all three. The handle for the bag is mounted on the back side (and on the OUTSIDE) of the bag, so that there is no intrusion of the handle's telescoping mechanism that encroaches on the interior space used for packing your equipment. In other words, you don't have the individual "columns" of the handles taking up room on the inside of the bag like you might find in many cases that have been marketed by various vendors. Additionally, the handle is of a sufficient height that it works well for taller people. I am 6'3" (well, okay, 6'2" now that I've entered that "shrinking" stage of life <g>) so many bags that I have tried in the past have had handles that were so short, even when fully extended, that the bag would nip at my heels as I was walking and pulling the bag. That does not happen with the Duet 2.0. As for the “bag” part of the case, let’s again start at the top. One of the BEST features of the Duet 2.0 is the fact that it is a top loader. 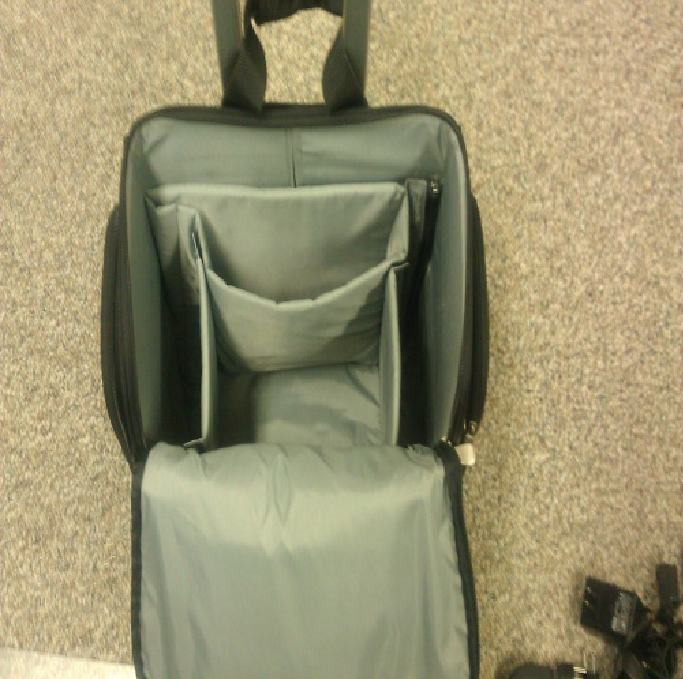 You simply roll the case up to the side of your chair, unzip it, and begin unloading. No more laying the case down and getting down on all fours to begin to set up your equipment. Simply reach in to one of the five (yes, FIVE) compartments and you are able to easily reach all your necessary items. Turning to the first and largest of the five compartments, the one for your machine, it fits every machine I have tried (the Diamante, the Mira, the Passport, the Revolution, the Lightspeed). Of those, the Passport fits most snugly and, of course, the Lightspeed the least snugly. For the Diamante, the Mira, and the Revolution, there is room left over even with each of them in place to put extra documents or perhaps exhibits or maybe even a set of headphones. There are two compartments of equal size that are on either side of the main machine compartment. In these I have placed my tripod, my AC adapter for my writer, my AC adapter for my laptop, a retractable extension cord, a power strip, my audio amplifier (for CART/captioning work), as well as a small bag that I carry which contains my software key, my microphone for audiosync, and that all-important bottle of aspirin! Even with all that stuff in those two compartments there is room to spare. In addition to the three compartments described above, there are two wider and narrower compartments immediately behind the main machine compartment. In those, I carry my laptop and my iPad. I have, when necessary, actually put a second laptop in the second of those compartments with my iPad, so there is enough room to do that. 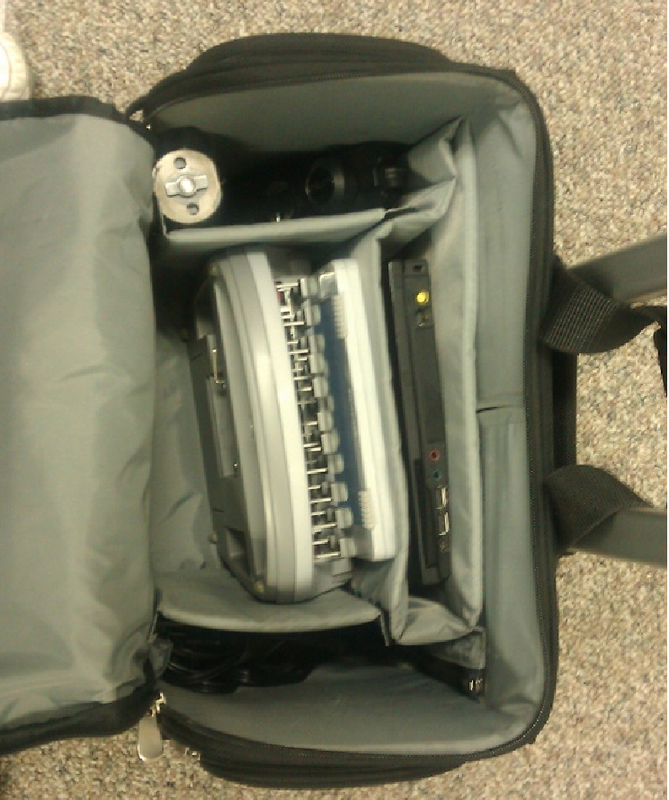 Again, remember that that will add weight so I only take a second laptop when necessary. Even when fully packed, there is still room in the inside of this bag to lay a stack of exhibits or even, perhaps, a change of clothes for that quick overnight trip. Now, moving to the outside of the bag, there are two side compartments that are on the exterior of the bag and two on the front of the bag. 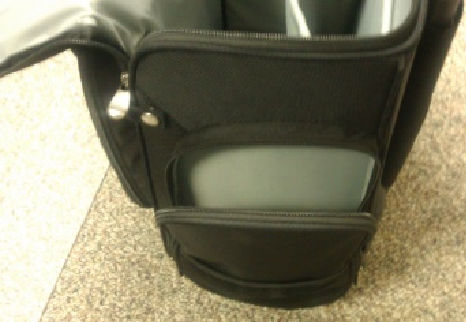 The two side pockets, as it were, are equal in size, and in one of them I carry my Stenocast wireless system and an audio cable for those times when I find myself in a video deposition and the videographer is not able to provide an audio cable. Luckily in my practice, that is a rare occurrence, but just in case it happens, I won’t be without a way to get a direct feed from the videographer. In the opposite side pocket, I carry extra AA and AAA batteries, my phone charger, my iPad charger, my Apple AirportExpress router (for setting up a network for realtime), and I still have room left over to stick in a granola bar. 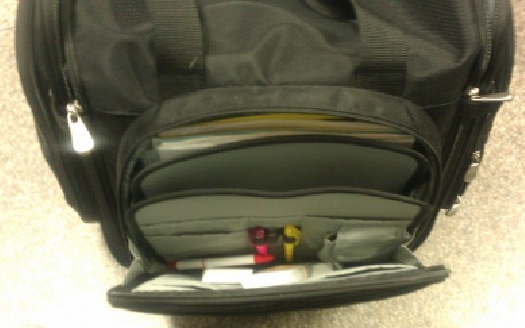 The large outside pocket on the front is where I keep my business cards, pens, highlighters, a thumb drive, a set of earbuds, my exhibit stickers, my job sheets, and any exhibits that will fit. There, again, is plenty of leftover room for other stuff that I might need to toss in at the last minute. The second outside pocket on the front is an open-at-the-top pocket that you can quickly slip documents into like driving directions, board passes, or other things. On the bottom of the bag, you will find two rollerblade-type wheels placed at the very edge of each side which not only roll smoothly and effortlessly but provide a good solid base and there is no tipping of this case from side to side. Nor, because of its design with a low center of gravity, is there any tipping forward from being front-heavy. You can feel confident in releasing the handle to grab for a door or an elevator button and know that the bag is going to stay exactly where you leave it. As well, there is a handle on the bottom of the bag for those times that you need to lift it using two hands (one on the handle at the top and one on the bottom of the bag. 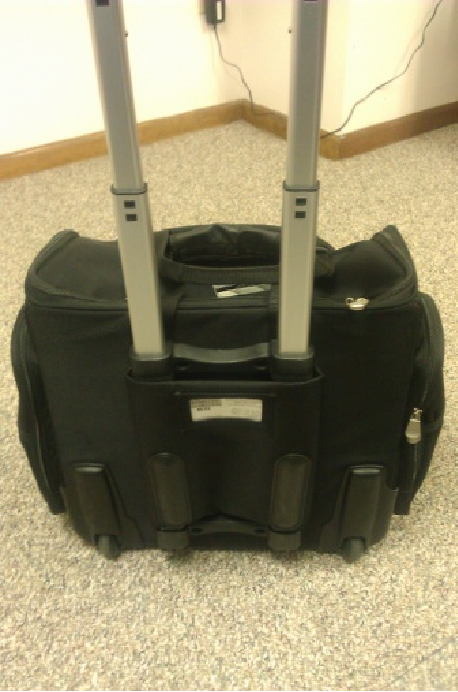 Although I am traveling by air much less than in the past, this bag is good for air travel. It fits nicely, even fully packed, in the overhead bins of any normal size airplane. I happen to live in a large city but we still are seeing more and more regional jets serving our market so you will not be able to fit this in many of the regional jets’ overhead bins. Carriers like Southwest, though, still provide plenty of room for this bag in their overhead storage. In summary, I have had this bag for well over a year and it shows no sign of wear and tear outside of what would be normally expected from dragging a case up a curb here and there. The zippers continue to remain solid, the handle mechanism works just like it did when new, and in all other respects it is standing up well. The only negative aspect to this bag is minor, in my opinion. That is, it is just a hair too wide to fit easily down the aisle of an airplane. All in all, I would have no hesitation in recommending this bag. I feel that it is a good value for the price.